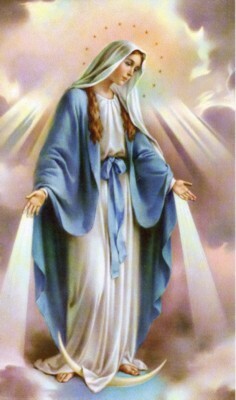 I love with all my heart my Holy Mother the Virgin Mary, and I want to believe all Church-approved apparitions. That being said, apparitions of the Virgin Mary are nice, but there are limits. A few visits to websites of so-called "Prophecies of the Blessed Virgin" or "Marial Apparitions" seem enough to convince oneself that Gullibility is sadly responsible for many schisms and heresies. 2.1) Constantly repeat your claims. Strangely enough, one of the most important "ingredients" to becoming a false prophet is to simply repeat your claims as often and noisily as possible! Lace your writings with snippets such as: "The Virgin told me that...", or "God revealed to me that...", etc. Don't forget that "There is a sucker (i.e. a gullible person) born every minute"! 2.2) Be vague. There really is such a thing as a prophecy, since for God everything is an Eternal Present, and God can transmit his knowledge of the future to his Servants. But don't remind your listeners that God is All-Knowing, that God doesn't see the future through blurry and mud-covered glasses. Make your "prophecies" vague. Don't give dates, places, names, etc. If some complain about this vagueness, tell them it's because you speak "mystically"! 2.3) The Virgin Sells. There is an old marketing proverb for false prophets: "The Virgin Sells". If you slap images of the Virgin Mary all over your website, suckers will come. Maybe blue and white dresses somehow activate gullibility neuro-transmitters in the brain? 2.4) Choose self-realizing "prophecies". Would you believe a car driver who "prophesized" that someday, the police would "persecute" him with speeding tickets? He controls the gas pedal! Of course he can predict that someday the police will "persecute" him. It's the same with a false prophet: he controls his mouth and his pen. All he has to do is proclaim heresies, i.e. disregard the "theological speed limit", and the Bishops will "persecute" him! He can then claim that these "persecutions" are the "proof" that God speaks to him! And since God supposedly "speaks" to him, then he can claim his heresies (which got him into trouble with the Bishops in the first place) are in fact good dogma! You have to admit the Devil is clever! Just don't try telling a policeman that the fact he is giving you a speeding ticket is somehow the "proof" that God gave you a special permission to drive at two hundred kilometers an hour in a school zone! 2.5) Use basic knowledge of Science. Recently, a "prophet" claimed to have "predicted" the tsunami that killed thousands of people around Sumatra. The "prophecy" basically claimed that an earthquake of magnitude 9 on the Richter scale would occur if something or other was not done. Of course, no dates, latitudes or longitudes were given! So where is the "prophecy"? We all knew that sooner or later an earthquake of magnitude 9 would occur somewhere in the world! We also know for example that an influenza epidemic will occur, and that it might kill millions (Note to false prophets: there is money to be made predicting such an epidemic!). 2.6) Ignore negative results. Don't make a permanent, detailed and public list of all your predictions, because people will be able to see how often you were wrong! This trick works so well that even bad pharmaceutical companies use it. They run a series of tests on a potentially profitable drug, and only keep the ones that seem to indicate the drug works. 3.1) Constantly repeat you are Catholic and faithful to the Pope. Just like #2.1 above, it's amazing how many people will believe you, as long as you just boldly assert your are in communion with the Apostolic See of Rome. (Here too, pretty images of the Virgin Mary help a lot). Don't remind your listeners that strictly speaking, only the Pope (or a Bishop in communion with the Pope) has the authority to claim you really are Catholic. Also, don't submit your writings to the local ecclesiastical authorities, or give details about the actual content of what you believe, and especially, don't ever say that if there should be a disagreement between you and the Pope, the Pope is right. 3.2) Don't mention who is supposed to judge the tree by its fruits. As a false prophet, you want to constantly remind your suckers that "a tree is judged by its fruits", and that the Catholic Church has always used that rule (among others) to judge new religious movements, or marial apparitions, etc. But don't mention the rest of that Rule of Discernment, i.e. that it's not the person who claims to have visions who discerns, but the Pope and the Bishops united with the Pope! "It's in this sense that the discernment of charismas is always necessary. No charisma can dispense from referring to, and submitting oneself to the Pastors of the Church" [CCC, #801, my emphasis]. 4) Why all this silliness? I guess we have to talk about Satan, again. The Devil wants people to cut themselves off from the Vine of Christ, so he will do anything that will encourage people to disobey the Pope, and the Bishops united to the Pope. 4.1) For the proud. It's not surprising that cult leaders often claim that they are so special and important that God speaks to them, that they are so virtuous that only they will keep the Faith, and that they have an immensely important role (like saving the Church from Apostasy, despite the "persecutions" of the "nasty and mean Church Hierarchy", etc.). 4.2) For the curious. It's not surprising either that many websites promoting "apparitions" and "revelations" feed the sinful curiosity of suckers, with a constant stream of "predictions" concerning catastrophic future events, or titillating details about the latest hairdo and wardrobe of the Virgin Mary, or pictures of the most recent "innovations" and "advances" taken by the paparazzi of dogma. Are all marial apparitions false? No! Are all false prophets evil? Certainly not, some of them must be erring in all sincerity Are all the "suckers", the gullible persons, just plain stupid? Certainly not, since the gullibility we're talking about is not caused by a lack of intelligence, but a lack of humility. Holy Mary, Mother of God, pray for us poor sinners. which is the best protection against sad gullibility.